When I began to practice intensive zen meditation two things soon became impossible for me in writing. First, it became impossible for me to be self-conscious. By this I mean it became impossible for me to strategize toward a standard for excellence, and to fret about how well I was realizing that standard. (Not that I entirely stopped doing these things, but that realizing that they were impossible I couldn’t take myself seriously when I did them). Second, it became impossible for me not to notice that when I was writing that was what I was doing, I was writing. That is, the most important and obvious fact of writing was that my mind was engaging words, that words per se were so strong in their presence that not only could I not ignore them, I had to write taking strongly into account the presence of words themselves and the feeling of being human with words, as a primary experience of and purpose in writing. And that words were an oddly disjunct experience. The result of these two impossibilities was freedom : I was free of myself, free of standards, and free of the need to force words to do what I wanted them to do. I could let words be as they were. In zen meditation I was “just sitting”. That is, I was literally sitting and breathing and allowing whatever happened to happen, without shaping my experience. In practicing like this I was allowing myself to be myself but also seeing myself in a wider scope – the scope of being alive and dying, which we call “time”. In writing I found that I had to do the same thing, only in language, in words, phrases, lines or sentences. I could let myself come and go and allow the words to find their own reasons. I was free to improvise. Later I found I could also revise, even revise repeatedly, in this same improvisatory spirit, trusting the shapes and meanings (if there were any) that arose from the play of mind and words. As a consequence I became quite interested in literary form as a conditioning factor. Almost every piece of writing I do is (in my mind, at least) a formal discovery. This does not make my work particularly original. Originality is beside the point. I very much feel that the words are of course not mine, they have circulated through the mouths and brains of innumerable speakers over the generations, so that engaging writing is also an act of solidarity and love. 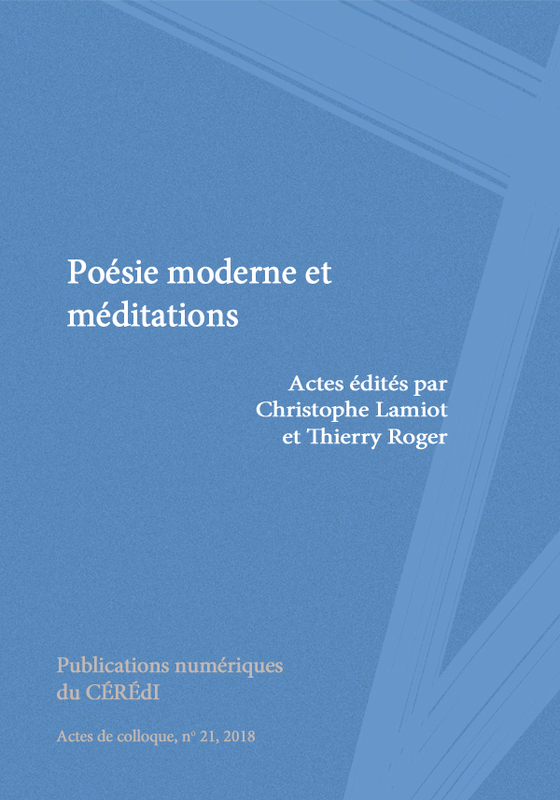 Norman FISCHER, « Meditation and Poetry » in Poésie moderne et méditations, Actes des journées d’étude organisées à l’Université de Rouen les 21 mars 2017 et 19 mars 2018, publiés par Christophe Lamiot (ÉRIAC) et Thierry Roger (CÉRÉdI). (c) Publications numériques du CÉRÉdI, "Actes de colloques et journées d'étude (ISSN 1775-4054)", n° 21, 2018.